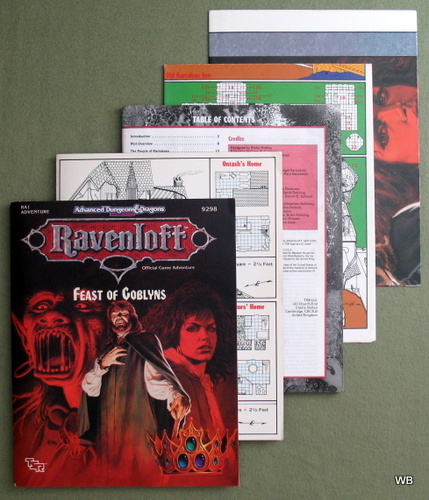 "In Feast of Goblyns, a party of adventurers is mysteriously transported from the lands they know to a dark and dangerous demiplane known as Ravenloft. 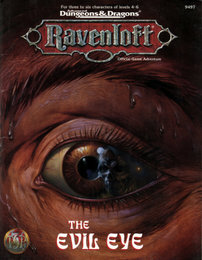 Trapped in this realm of terror, they must use all their skills to escape the manipulations of one of Ravenloft's most powerful lords as they attempt to seek out the accursed Crown of Soldiers [Actually is "Crown of Souls" ...Wayne]. If all goes well, they just might live long enough to escape this dread land and return to their homes. • A full 96 pages of gripping adventure set in the dark domains of Ravenloft. 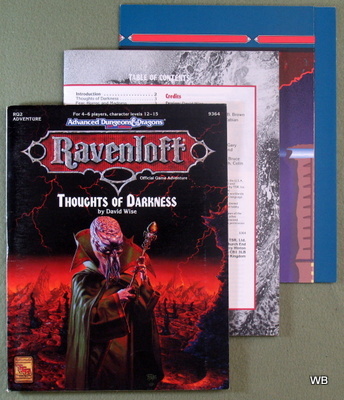 • A special AD&D game character record sheet designed especially for Ravenloft campaigns. 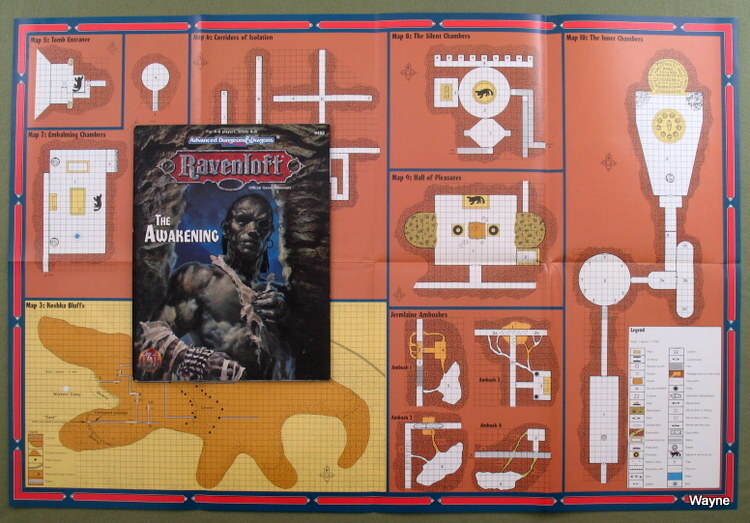 • An invaluable addition to the AD&D Dungeon Master's Screen that incorporates all the most vital information from the RAVENLOFT Boxed Set. 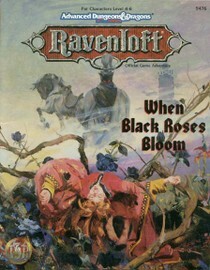 • A full color poster by one of TSR's most popular artists, Clyde Caldwell." 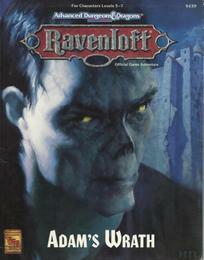 "The mists of Ravenloft know no boundaries and observe no rules. One way or another, they always get what they want - this time with some help from a cursed captain and his ship. Player characters boarding an innocent-looking ship will soon find themselves aboard a haunted vessel, destined for an island inhabited by a new form of undead creatures. But that's not the end of the horror - an evil necromancer lies at the root of the evil on the island. The battle isn't over until he's been defeated! 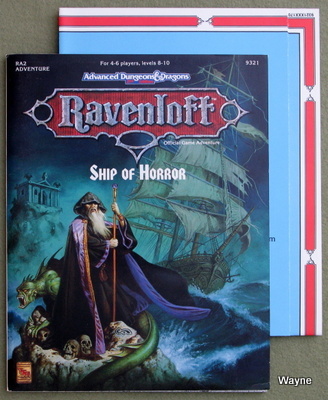 Ship of Horror is an adventure set in Ravenloft with two beginnings: one for PCs already in Ravenloft, and one for DMs looking for a way to push his PCs into Ravenloft from other worlds. The adventure includes three new monsters, new spells, and several handouts ready for distribution to players. Ship of Horror is an adventure for four to six players of levels 8-10 looking for grisly chills and thrills!" "This mists of Ravenloft envelop you once again. When you realize where they've taken you, it's too late. You find yourself in the burning wastelands of Har'Akir - where nothing is as it seems. The desert is a powerful foe, but in Har'Akir, an ancient evil is awakening and the desert will be the least of your worries. As withered hands cast off ancient shrouds, little can save you from the touch of death." "The Grand Conjunction has come to pass! As a result, the lords of Ravenloft have broken through the Mists and escaped into the Prime Material Plane. Bit by bit, monsters of the demiplane of dread are following behind. And in the midst of all, Azalin the Lich and Strahd von Zarovich play a power game - a game with deadly stakes, most notably the player characters' lives. Unless the adventurers act quickly, death will be the least of their troubles! This is the second of two adventures that feature Azalin and Strahd von Zarovich in their endless conflict. 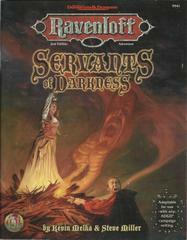 As a sequel to From the Shadows, this module gives the player characters an opportunity to atone for the evil they unwittingly caused as pawns of Azalin. The culmination of a six-part series of adventures dealing with the Grand Conjunction, Roots of Evil gives the player characters an opportunity to literally save the universe (as well as themselves!). Until the dark powers recapture the lords of Ravenloft, no place is safe..."
"Beware what you wish, for it might come true" is an old Vistani saying. In the small town of Odiare, a toymaker has wished a puppet to life - only this puppet is not a friendly, playful toy. It is a thing of evil, bent upon killing all the adults of Odiare. When the player characters are trapped within this town, Maligno the puppet and his animated toys begin to hunt them down. The PCs' only chance for escape is to defeat the mad marionette." "Rakshasa... For centuries, these diabolical creatures have hunted humanity and preyed upon its flesh. Now the Mists have opened upon the land of Sri Raji - home of dread Arijani, the rakshasa lord. He is the mastermind behind a deadly game of illusion where plots lie within plots that lie within plots. Wise player characters will trust neither their eyes nor their wits, for nothing is as it seems in Sri Raji. The rakshasa have laid their traps of intrigue for the unwary. This time, the unwary are your characters." 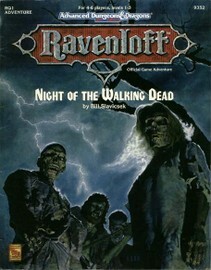 "Far above the village of Barovia sits Caste Ravenloft, the home and fortress of vampire lord Strahd Von Zarovich. 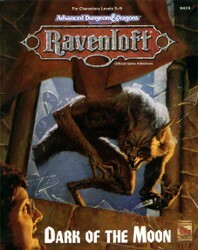 Legends claim that Strahd flies with the bats and runs with the wolves to terrorize the countryside. Ancient tales tell of dungeons and catacombs deep under the castle. 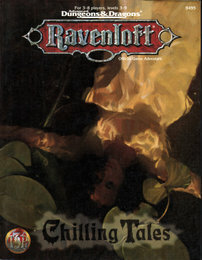 Other stories recall the great halls, treasures, and glory of Ravenloft in centuries past. Undoubtedly, Strahd has installed deadly safeguards to protect his domain. 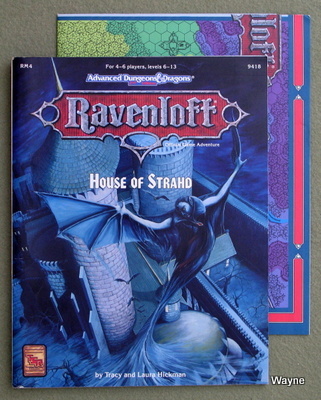 House of Strahd is a revision of the classic gothic horror tale Ravenloft - the most popular adventure ever produced for the AD&D game. 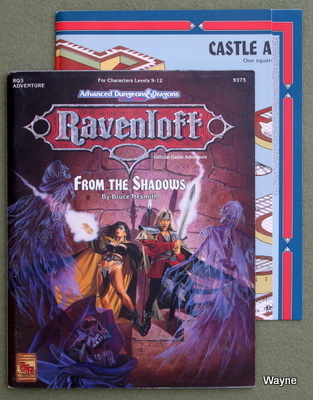 It is updated here using the AD&D 2nd Edition rules and those from the RAVENLOFT campaign set. Count Strahd is now more powerful, and his castle is even more terrifying! • Variable goals for Strahd, making the adventure unpredictable. • Both original and updated statistics for Strahd. 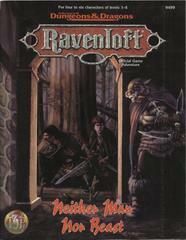 The adventure can be played at the original level of difficulty, or with the newer, more powerful Strahd. • Hints for the DM, including tips on playing Strahd as a genius vampire lord. • The original gypsy fortune-telling, plus two new methods to suit the DM, including one version using the tarroka deck from the Forbidden Lore boxed set. The master of Castle Ravenloft is having guests for dinner. You are invited..."
As the pallbearers life the coffin, something scrapes on the wood from inside. Quickly and without emotion, the attendants slide the casket into a crypt. Then they seal the door and flee. Behind them, unheard, a dull thudding begins, growing louder with the onset of twilight. There can be no peace for those who linger in the earthly realm after death. And there can be no sanctuary on the Night of the Walking Dead! For 4 to 6 players, levels 1 to 3." 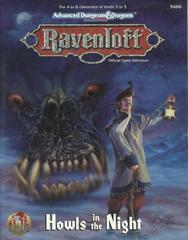 "Of all the inhospitable domains in the RAVENLOFT campaign world, Bluetspur is the cruelest and most gruesome. Nothing grows in the endless night, and lightning periodically falls like rain. The only place to escape those storms is inside the mind flayers' complex under Mt. Makab, but that is the last place where any sane person would want to go. The High Master Illithid has been hatching black plots by hatching vampiric mind flayers in his laboratories! His prodigies are horribly insane, but if he can complete his plans, he will achieve a new level of dark immortality. A pair of heroes has stolen the key to his success, but they have paid a heavy price for their bravery and are in desperate need of aid unlooked for. Meanwhile, the Lord of the Realm watches over the proceedings and plays havoc with the wits of both sides, sapping strength and will with all-powerful thoughts of darkness. A party of adventurers will need all of their skills to escape this black domain without the loss of life, power, or sanity! For 4 to 6 players, levels 12-15." This is the first of two adventures that feature Azalin the lich and Strahd von Zarovich in their eternal conflict. This module contains complete floorplans for Azalin's dark home, Castle Avernus. From the Shadows will take characters to places they've never been before - places spoken of only in hushed whispers and terrifying legends." "For many years folk have gazed into the churning black vapors of the Shadow Rift and wondered at the horrors that might lie within. Some have speculated that it might be a realm of the doomed, where tortured spirits suffer the hours of eternity. Others have speculated that it might be an empty domain, waiting for the arrival of a master who is evil enough to claim it and shape it in his own image. Even the mysterious Vistani do not know what secrets are hidden in the depths of this gaping chasm. Now, the time has come for the veil of shadows to be parted. Loht, king of the shadow elves, has reclaimed the mighty Sword of Arak. With this relic, he intends to set in motion a plan that has take thousands of years to form. He will throw open that very gate of darkness and invite one of mankind's greatest enemies to walk the land of the living. And if he is not stopped,the rivers of Ravenloft will run red with the blood of the innocent. 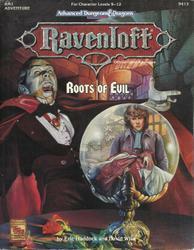 This adventure can be played independently or in conjunction with the RAVENLOFT adventure Servants of Darkness. For four to six characters of levels 7-9." An adventure featuring the loup du noir (skin-changer). "In the bitter cold of a land mired in eternal winter, hunters take the shape of wolves to better kill their prey. They stalk the snow-filled forests on paws of deadly silence. Powerful and swift, these evil shapechangers roam the land at will, murdering those who oppose them and plundering the weak. At the head of this pack paces the great Black Wolf of the wood. Is this murderous beast the underling of Gregor Zolnik, the boyar who rules this waste? Seeking to extend his conquests by any means he can, Gregor has cowed the land of Vorostokov by relying on ruthless strength and savagery. Are your player characters clever enough to survive against villains who are stronger, faster, and fiercer than any they've ever encountered? The Black Wolf awaits your answer in the biting cold..."
"In the domain of Lamordia, Doctor Victor Mordenheim created Adam - cobbling the creature together from parts of human corpses. Now, years later, Adam wants revenge. Adam wants Elise, Victor's wife. Adam wants Victor dead. The player characters' ship founders on the coast of the domain of Lamordia. A vicious storm leaves them washed ashore, cold and hungry on the ice-bound Isle of Agony.... Then the terror begins. The adventurers embark on a journey of fear that leads from certain doom on the frozen island to a strange new life at Schloss Mordenheim. To return home they must challenge Adam himself and discover a portal - a gate that might lead homeward. Adam's Wrath is intended for a party of four to eight characters of 5th to 7th level. Carefully designed to allow a DUNGEON MASTER to launch from any campaign world or Ravenloft domain, Adam's Wrath is an adventure your characters will never forget - if they survive!" "Upon the horse plains of Nova Vaasa, the Koshka Bluffs rise from the earth like gigantic, misshapen tumors. They give up stone to feed the sheer walls of Castle Faerhaaven, but lately they have yielded stranger objects: figurines, coins, and other odd artifacts, which curse those foolish enough to claim them. Now, the ancient priestess Sachmet has awakened from a timeless sleep to come and take them back..."
"A madman stalks the fog-shrouded streets of Paridon, killing with gruesome precision - and always at midnight. A party of brave adventurers witnesses the most recent of these brutal murders. Now that they've seen the killer's face, they're sure to be his next targets. Who can be trusted in this city where the residents are not what they appear to be? Those who dare to track the killer will find strange allies - and even stranger enemies. The adventurers must investigate the ancient mystery behind the murders that take place when the clock strikes the "Hour of the Knife." This 64-page adventure includes a full-color poster-sized map of Paridon. The adventure is based on the popular RPGA Network tournament by Bruce Nesmith." "The Mists of Ravenloft draw close, surrounding unfortunate travelers in their clammy embrace. When they part, they reveal the land of Mordent, a domain of rolling moors and woods, beautiful by day and terrifying by night. A new danger lurks in the haunted moors: hounds whose mournful howls and murderous jaws trap the townsfolk in their homes at night. At the heart of it all lies a curse laid a century ago, and a tale of bitter tragedy. Howls in the Night is a dark fantasy murder mystery - but one in which the victim has been dead for 100 years! Alternate adventure backgrounds allow the Dungeon Master to choose one of four possible conclusions." "The nightbound realm of Sithicus is dying! The grey forested crags scarred by jagged rifts echo with the laments of the dying elven nation. But the lord of the land sits uncaring on his blackened throne in the charred castle of Negragaard, lost in ancient memories. Through his passion and hatred the nightmare haunted death knight, Lord Soth, permitted catastrophe to befall his native world of Krynn. Now trapped in the Realm of Terror, Soth has once more brough calamity to his home. Abandoning rule of his twisted realm of Sithicus, Lord Soth has retreated to a still more distorted domain: the mad fantasies of his own history. To save the land and themselves, the heroes must venture into banshee-haunted Nedragaard Keep, and there into the warped mindscapes of a tormented darklord. 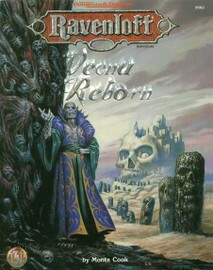 The history of the greatest villain of the DragonLance Saga is at last revealed in the Realm of Terror. 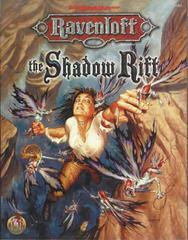 For fans of DRAGONLANCE and RAVENLOFT adventures alike. This grand adventure is suited for four to six player characters of levels 4-6. No prior knowledge of Krynn or the DRAGONLANCE Saga is necessary." "The Mists of Ravenloft lead to G'Henna, land of famine and zealous devotion to Yagno Petronova, high priest of the Beast-God, Zhakata. In the cities of G'Henna, worshippers starve themselves to prove their faith; in the Outlands, twisted mongrelmen struggle to survive in a land of unforgiving windstorms and bleak plains. No domain in the Demiplane of Dread has been in greater need of change - and the subtle agents of the Circle of Darkness wish for nothing less than the overthrow of their oppressive leader and create a new order lead by Zhakata himself. Circle of Darkness is a dangerous adventure for heroes willing to face not only the Dark Lord of G'Henna, but also the greater evil which threatens to overcome him. The fate of an entire domain is in the heroes' hands! For 4 to 6 characters of levels 5 to 7." • Haunted graveyards, manors, and tombs, a bardic library with an unexpected room, ancient catacombs, and an entire town turned to dark terror. • Deadly and unexpected foes: a vampire who walks in the sun and laughs at clerics, a mummy whose touch turn living flesh water, and a fearsome host of others: a darkling, a vassalich, a ghost, fiends, golems, a graveyard elemental, and a mad scientist. 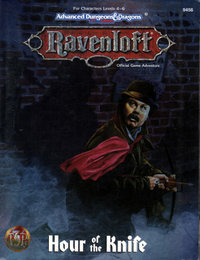 • Doctor Rudolph van Richten, author of the learned Van Richten's Guides, summons player characters from levels 3 to 9 to wipe out the evils that haunt Ravenloft." "Welcome to Invidia, where Vistani curses come to their terrible fruition. As a young girl, Gabrielle Aderre was warned by her mother never to have children: "A man, a babe, a home - these things can never be for you, for tragedy will be the only result." Now the witch Gabrielle has disobyed her mother and borne a child, an abomination that could spell doom for Vistani everywhere. Gabrielle has learned too late the truth of her mother's prophesy. The Evil Eye is a series of six scenarios involving the Vistani and their most hated nemesis, the legendary Dukkar. The adventurers uncover the hidden secrets of Karina, the largest town in Invidia and home to the most terrifying festival in Ravenloft. The heroes will arrive to see a town in the throes of Carnival - a time when ghosts and madmen, werewolves and gypsies all mingle under the waxing moon. 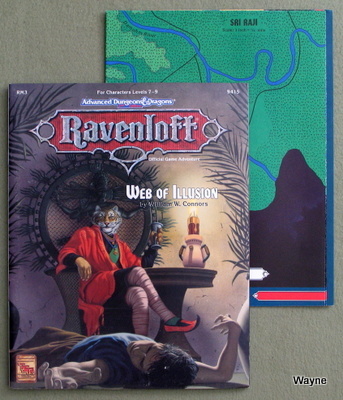 Inside this package is a 64-page book containing all the information needed to run The Evil Eye, plus a full-color mapsheet showing the land of Invidia. Van Richten's Guide to the Vistani and Van Richten's Guide to Fiends are helpful sources of information to expand and enrich these adventures, but are not necessary for play." "Shipwrecked on a desert island! Marooned among savage creatures who seem half human, half animal. Who can you trust? Kindly old Doctor Fran and his beautiful companion? The strange monks said to guard an evil artifact in the mountain fastness? Or a beast-man chief who gathers his people and prepares for war? What can you do when the Mists deposit you in the city of Lekar? The militia is no better than a gang of sadistic bullies, the citizens are more contagious than a fleet of plague ships, and every foot of public space is covered with corpses of criminals who committed no crime greater than struggling to survive in the oppressive domain of Falkovnia. A secret society of assassins, known only as the Ebon Fold, has been hunting down visitos to Lekar and killing them in a most grisly fashion; all that remains of the victims are dessicated husks that crumble to ash when touched...and you are their next targets. When everyone who has befriended you is either dead or hunted by the authorities, you have no choice but to fight back. But the Ebon Fold is a numberless horde whose leader holds sway over death. How can you defeat enemies that won't stay in the grave? They strike from the depths of darkness and steal your life...one dagger stroke at a time. This 64-page adventure can be played independently, or as the opening challenge in the Grim Harvest series that continues with Death Ascendant and concludes with Requiem. Inside this package is a poster map that fully details all 10 levels of the chilling complex known as the Well of Bones. For three to six characters of levels 5-7." The remnants of Ebon Fold are cutting a deadly path through the Falkovian countryside, draining travelers of their life force and leaving withered corpses in their wake. Hot on their trail, you come across the sole survivor of one of these deadly attacks, a young vistani man with an extraordinary skill for fortune-telling. His tarokka deck helps close the gap between you and the assassins. Together you follow the trail through Darkon, the dark domain of the lich lord Azalin, to the city of Nartok. Something very strange is happening in Nartok. The killers enter the Temple of Eternal Order and don't come out. It seems that the state relgion of Darkon is giving succor to these assassins. To make matters more confusing, the Kargat, the domain's secret police, has put aside its feud with the Eternal Order and has a large contingent staying at the temple as well. These three organizations working together bodes ill for the residents of Nartok. Great amounts of life energy are being collected for some foul purpose, although no one seems to know what exactly it is. The tarokka cards provide only mysterious glimpses of the future - a future in which a powerful evil sweeps the land and Death walks the world. Can you discover the truth of what is happening in the temple in time to avert the disaster predicted by the cards? Death Ascendant is a full-length adventure that can be run as a stand-alone scenario or as the second part in the Grim Harvest series. 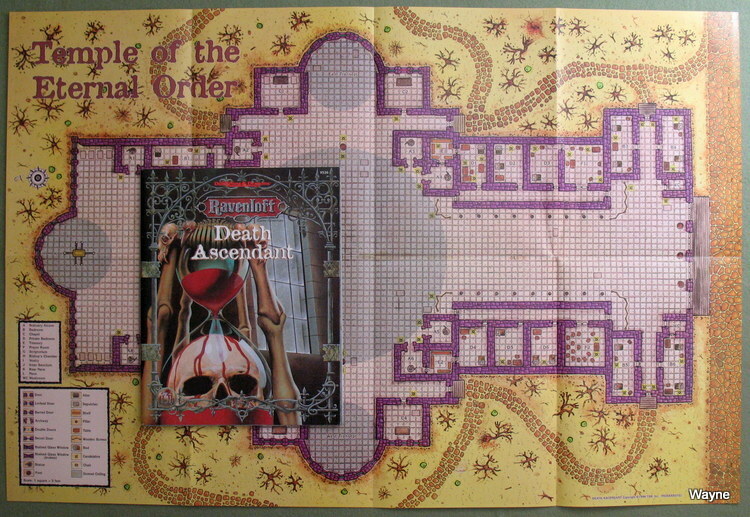 It contains a 64-page adventure booklet plus a full-color poster map detailing the Temple of the Eternal Order. For three to six characters of levels 6-8"
"Their spirits trapped by a cursed magical weapon, the heroes find themselves imprisoned on the surreal domain of Aggarath. Here, they must explore the mind of Chardath Spulzeer, the insane lord of the realm. Somewhere in his shattered dreams and tormented memories lie secrets that may enable the adventurers to escape. 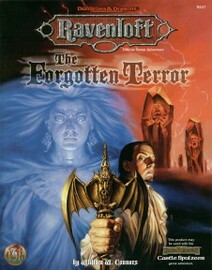 The Forgotten Terror is a new adventure for the RAVENLOFT campaign setting. It can be played as a stand-alone scenario or as a sequel to events depicted in the FORGOTTEN REALMS adventure Castle Spulzeer. 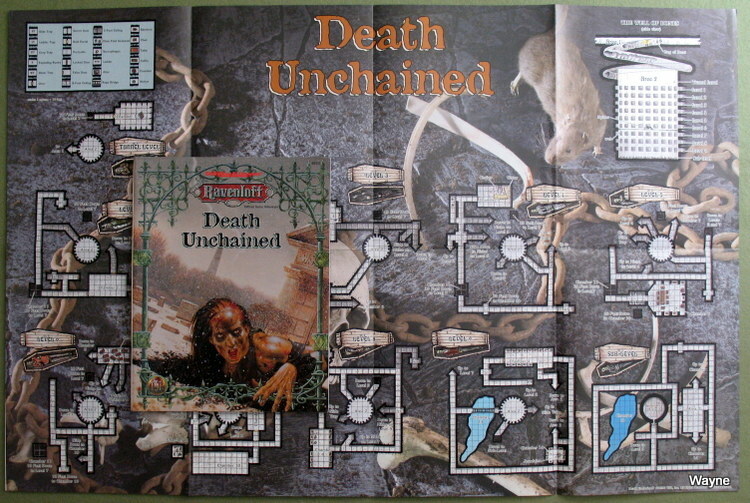 The unique nature of this domain and scenario makes The Forgotten Terror easy for the Dungeon Master to run without forcing players through a linear plot. Alternate endings allow the DM to link this adventure to Ravenloft, the Realms, or any other campaign world. For 4 to 6 characters of levels 10-12." "Young Bryonna has been judged guilty of consorting with the dark forces of Tepest, and now she will burn at the stake for it. The Inquisitors, priests whose zealousness sometimes stirs whispers of doubt among the people, have condemned her with all the surety that comes with their "holy" power. Heroes of integrity and justice are needed to ferret out the truth. To succeed, they must travel a perilous path that winds through the labyrinthine tunnels of Mount Lament and leads them to the dreaded Hags of Tepest and Tristessa the banshee. Worse still, they must ultimately face the mysterious Prince of Shadows, who manipulates the denizens of the domain for his own evil purposes. When to stand fast? When to run? Only those who survive can say. 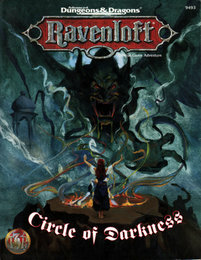 Servants of Darkness is a stand-alone adventure that can also lead the party to investigate the misty chasm at the center of the Demiplane's Core in The Shadow Rift, the next release for the RAVENLOFT campaign setting. 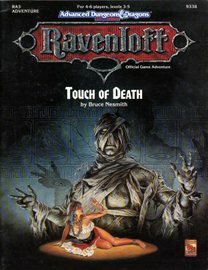 For four to six characters of levels 4-6"
"Trapped by the Mists of Ravenloft, the lich lord Vecna plots his escape and revenge against Kas the Destroyer, his traitorous former lieutenant. 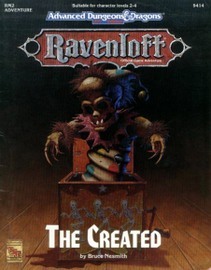 Wizards of the Coast owns (and holds trademark to) the AD&D game and Ravenloft in all forms.